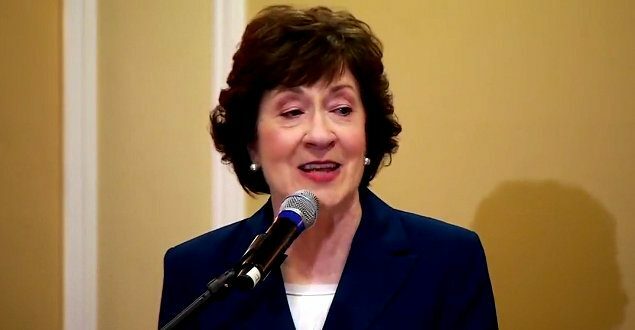 GOP Sen. Susan Collins: No Run For Maine Governor - Joe.My.God. At a press conference streamed live on Facebook just now, Republican Sen. Susan Collins announced that she will not leave the Senate next year to run for governor of Maine. Collins put an end to months of speculation when she made her announcement at the Samoset Resort in Rockport Friday morning. Collins is Maine’s senior U.S. Senator, having held her seat as a Republican since 1997. Contemplating whether to give up her seniority in the United States Senate and the influence it grants, has been a major factor in her decision. Collins had postponed making her decision because those close to her said she was carefully giving thought to what would be best for Mainers. BREAKING: Republican Susan Collins of Maine says she is staying out of governor’s race, chooses to remain in divided US Senate.